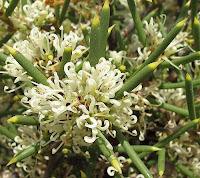 Hakea obliqua has two subspecies with the other (subsp. 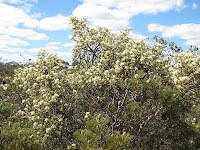 parviflora) being to the west of Ravensthorpe and not occurring in the Esperance region. 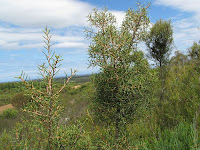 Subspecies obliqua is very common and can be found in a variety of habitats and soils, from low-lying flats to hillsides, in sand, gravel, clay and over granite, plus in combinations of the above. 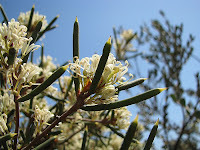 It normally grows as an upright spindly shrub to 3 metres (10’) in height, with just one or a few vertical branches that are clothed in vicious skin piercing leaves, and certainly not a plant you would want to stumble against. The fruits are very corky to 5 cm (2”) diameter, although immature ones and some forms have a covering of smaller projections. 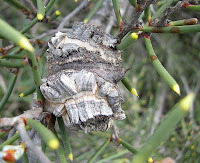 This has lead to this shrub being divided into two species, with the corky fruits one classified as Hakea brooksiana, but which has now been absorbed into Hakea obliqua subsp. 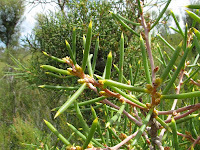 obliqua. 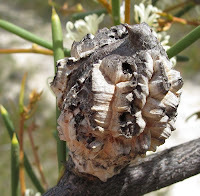 Probably this confusion arose due to a higher number of immature fruits initially being collected as specimens, as these are easier to obtain amongst the very sharp spiny foliage. Structurally it is an interesting plant as they stand like sentinels above surrounding vegetation, plus when in flower the massed white blossom is quite showy. 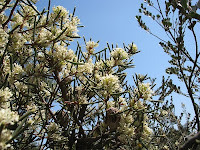 These flowers are insect pollinated and bloom from September to November, depending on habitat type and the extent of seasonal rainfall.